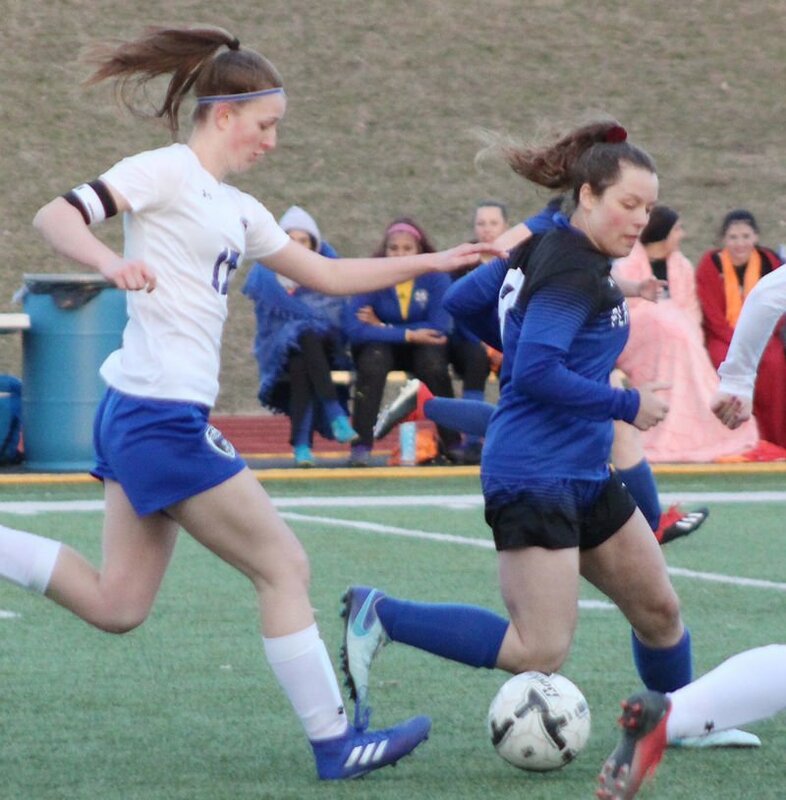 PLATTSMOUTH – The Plattsmouth girls slowed down Bennington’s high-powered offense for the first 40 minutes of Monday night’s match. The Badgers sped into the fast lane with their offense after halftime. Bennington broke open a close game with six second-half goals in an 8-0 victory. The Badgers improved to 5-1 and won their fourth game away from home. Bennington entered the contest with one of the top offenses in Class B. The Badgers had outscored their five previous opponents 28-6. The team had posted ten or more goals against both Schuyler and Omaha North. Miley Prine gave Bennington the early lead with a goal ten minutes into the match. She took a pass from Jordan Hill and booted the soccer ball into the net. The score remained the same until the 7:12 mark of the first half. Deja Daniels chipped a pass to Prine down the lefthand sideline that bounced high in the air. Prine gathered the pass and produced her own bouncing kick to get the ball past the defense. She then knocked a wide-open shot into the net. Plattsmouth’s defense held the Badgers to six shots on goal in the first half. The team forced Bennington to play a large portion of the opening stretch in the midfield area. Bennington used crisp passing to rewrite the game’s storyline in the second half. Mia Hurt opened the scoring surge when she took control of a straight-line pass by the 40-yard line. She raced downfield for a breakaway goal with 34:17 to go. 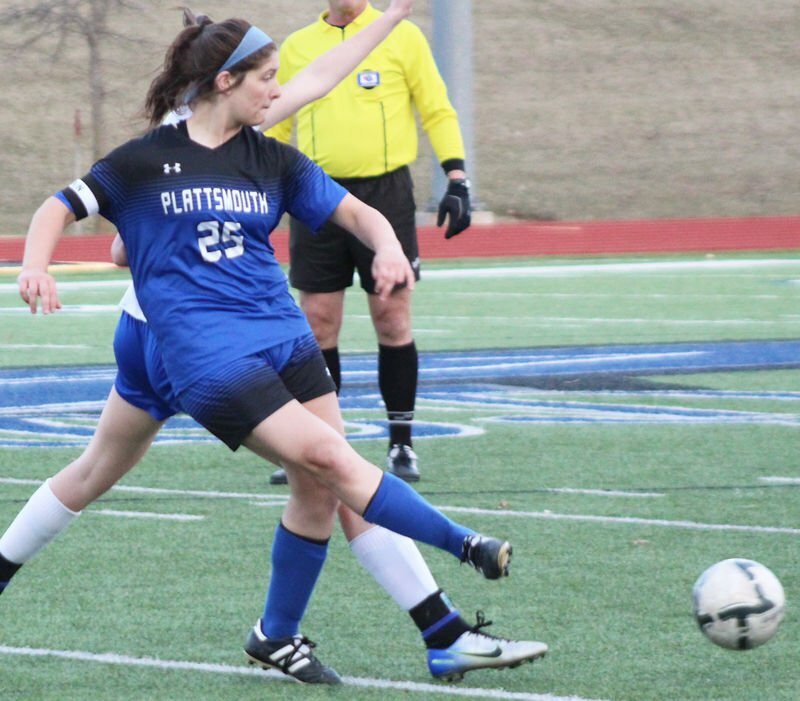 Prine collected a hat trick with her third goal of the night five minutes later, and Hurt converted a Plattsmouth turnover into a goal at the 26:23 mark. Hill tapped a crossing pass into the net for a 6-0 lead less than two minutes later, and Hurt generated a hat trick with a goal with 19:33 left. Marta Morosi created the final margin with a late goal. Plattsmouth (1-5) will resume its season Thursday with a 6:30 p.m. match against Nebraska City. The teams will play the league contest at Blue Devil Stadium. PHS will continue its homestand April 8 with a 7 p.m. match against Waverly. 1st half: 1, Bennington, Prine, 30:08, 2, Bennington, Prine, 7:12. 2nd half: 3, Bennington, Hurt, 34:17, 4, Bennington, Prine, 29:09, 5, Bennington, Hurt, 26:23, 6, Bennington, Hill, 24:40, 7, Bennington, Hurt, 19:33, 8, Bennington, Morosi, 0:29.